A return to the brilliant turbo Lancers that we so loved? Mitsubishi’s release of the Ralliart Lancer marks a return to affordable mid-sized Mitsubishi turbo cars. Available in sedan and hatch (‘Sportback’) models, both cars are stickered at AUD$42,990. With a long specs list that includes a 177kW 2-litre turbo engine, driver-selectable multi-mode active all-wheel drive, SST twin clutch automatic transmission and Evo-esque body kit, on paper the Ralliart looks the goods. But what’s it like on the road? Rather like its more expensive Evo brother, the Ralliart is a mix of good and bad. The all-wheel drive system comprises Active Traction Control, Active Stability Control, Active Centre Differential and Electronic Control, and a rear mechanical limited slip differential. In short, that’s most of the all-wheel drive system fitted to the 50 per cent more expensive Evo model – and on the road it shows! Tyres are good quality 215/45 Yokohama Advan A10 – put a sophisticated and impressive all-wheel drive system together with sticky rubber and you get a level of grip so high that, in all normal conditions, you simply point and squirt. There’s little body roll and the characteristics of the all-wheel drive can be subtly altered by selecting Tarmac, Snow or Gravel modes. Push really hard and the car torque-steers a little – but it’s noticeable only in that a firm hand is needed on the steering when exiting tight bends. At the limit there’s also some understeer, but it’s quite restrained. The handling is not at the expense of ride quality, which remains excellent for a sporting car. The steering, too, is a delight, with great feel, weight, feedback and ratio. 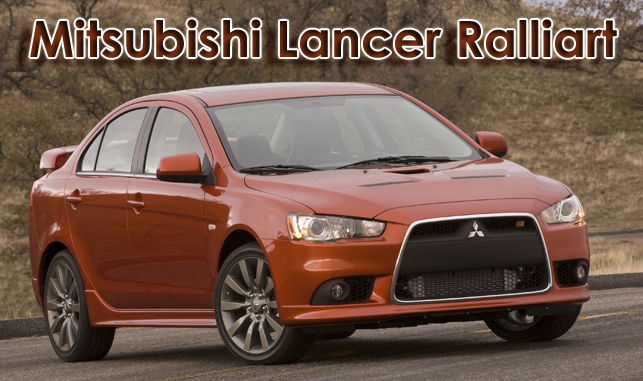 In fact in terms of handling, ride and steering, the Lancer is like a car costing $100,000 or more. 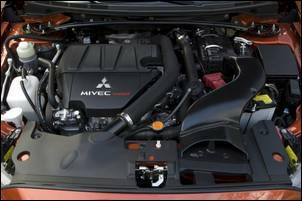 The 4B11 16-valve design uses MIVEC variable valve timing and the turbo is a single scroll unit that, according to Mitsubishi, is designed to “focus on low- to mid-range torque”. But if that was the intention, someone got things quite wrong. 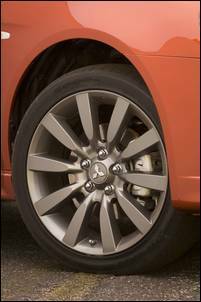 Peak torque is listed in one Mitsubishi document as 343Nm from 2500 – 4750 rpm, which sounds great. But another Mitsubishi official spec shows it occurring at 4725 rpm – and that’s more like it feels on the road. Add the lack of bottom-end power to a mass of 1555kg (some quarter-tonne heavier than the base Lancer ES model! 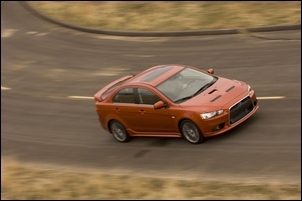 ), and the Ralliart can be reluctant to pick up its heels and really get going. Not helping in this is the SST transmission. Without a torque converter and with poor low-rpm torque, the driveline always needs plenty of revs on board before performance starts to get quick. But in Sports mode, which keeps revs higher, the trans is much better behaved. And, if you view the SST trans as a manual with electronic gear changes, then the system operates very well – especially with its ultra-fast gear changes. We think the engine would work better with a 6-speed manual trans (and couldn’t that also lower the car’s price? ), and the SST trans would work better with an engine with a lot more bottom-end grunt. 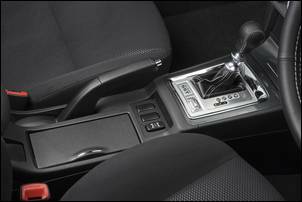 In short, the driveline simply never has the sophisticated competence of the Lancer’s handling or steering. Inside the car you’ll find a comfortable – but not roomy – place. Unlike some cars of the Lancer’s size that have lots of space, the Lancer is more of a two-adults-plus-two-children car. The boot opening is small and the boot floor just thin pressed wood that looks like it would be easily damaged in routine use. It covers a spacesaver spare. Unusually, we found it hard to get comfortable behind the steering wheel. The seats are good – the culprits were the lack of reach-adjustment of the leather steering wheel and the way the driver’s seat height adjustment lifts only the rear of the seat. No less than seven airbags are fitted. The doors shut with an awful hollow clang and the glovebox and centre console box are not air-conditioned. The radio uses an LED display that is impossible to see in some sunlight conditions (what’s wrong with LCD digits?) and fuel and coolant gauges are available only as selectable displays on the LCD in the centre of the instrument panel. The Lancer Ralliart is like two different cars. One is a car with enormous competence in its steering, ride and handling – amazingly good at this price. It’s also surprisingly comfortable and practical. In fact, in its sheer unfussed brilliance, it reminds us of a late model Porsche. But the other car features an engine that can be quite coarse (eg on cold start), has a poorly matched turbo and uses an auto trans that needs far more development. A bit like a mid-Nineties turbo Subaru. 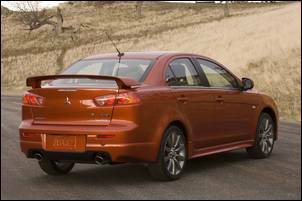 The Lancer Ralliart was provided for this story by Mitsubishi Australia.